Here is one of Peter's "Bug Knives" as a Liner Lock®. Rare and hard to make, you don't see many of these. The base (Wings) and screws are solid 18 K Gold that Peter made. The scales are bark Mammoth and highly figured natural Black Lip Pearl. The blade is Peter's Mosaic Damascus, that he hot blued, and is 2 1/16" in length. The overall length is 5 1/8". The 18 K Gold thumb stud has a nice Emerald installed. The bolster material is from the Super Conductor project down in Texas. Did you notice the butterflies in the Mosaic Damascus of the blade. What skill! 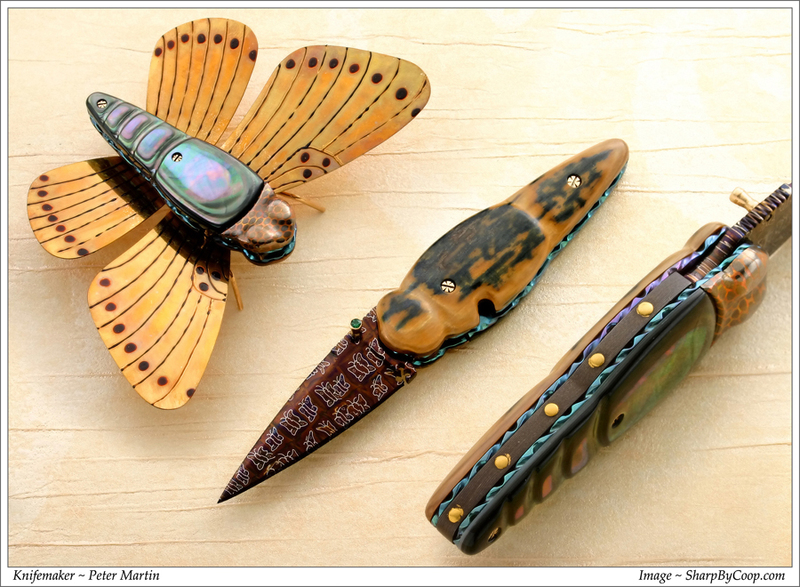 If you want to purchase Peter's "Bug Knife", click here. Ethical practices and the concerns of my customers are given first priority. If you are not satisfied with your knife, return it within 5 days in the same condition as you received it for a full refund, less shipping. Shipping and insurance is 15.00 in the USA, Canadian shipments are $20.00.